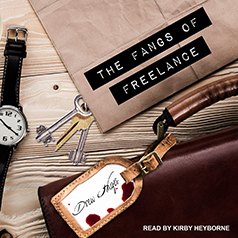 Drew Hayes presents The Fangs of Freelance—the fourth book in the hilarious series following Fred, the vampire accountant, and the misadventures he finds himself in. As a freelance accountant for the Agency, Fred soon finds himself being tossed into new, unexpected, and perilous situations. From inventorying ghostly castles, to exploring unsettling amusement parks, to negotiating with dangerous mages, it seems there is no end to the uses for an accountant of Fred's specialty. But dangerous as the new jobs are, the greatest threat may come from the past. An old enemy is making waves once more, an enemy who would go to great lengths to destroy Fred and everyone he loves. And this time, they've brought backup.